This module is due to be offered for study at five British universities and colleges. For these see the ‘Universities’ page. This screen and the next three give various kinds of information about what the module involves and how to make the most of it. If you are reading this because you are at one of the five universities/colleges and you will or might be studying the module, you need to know which member of staff is designated as the Module Convenor. He or she will oversee your study of it. If you don’t know who this is but wish to begin the module soon, you need to find out fast: go to the ‘Universities’ page and contact the member of the Virtual Plater committee named there as the contact for your HE institution. If you have any questions about practicalities as you study the module, the Module Convenor is the first person to raise them with. He or she might then direct you to contact someone involved in the Virtual Plater project. The module is divided into eight units. Each unit is designed to take the same amount of study time. There are two assignments you will need to do (to complete the module formally), and the time spent directly on planning and writing these is in addition to working through the units. You can start the first assignment when you are half way through the module, at the end of Unit 4. The second is to be done after you have finished Unit 8. If you are doing the module within a Higher Education course, you will be studying it for either 20 credits or 15 credits. You probably already know which it is. If you don’t you need to check this with your Module Convenor. If you are studying the module for 20 credits, you need to do all eight units. Therefore you simply need to start at the beginning and follow the path. If you are studying the module for 15 credits, you need to do six out of the eight. Units 1, 2, 4 and 8 are required. You can choose to do any two of the other units: 3, 5, 6 and 7, although this is subject to approval by your Module Convenor. NB You will need access to the internet throughout your study of this module. This is to give you access, not only to the module itself, but also to the readings you are asked to do along the way. ‘secondary literature’ on CST: discussion and assessment of it by scholars and other writers. Let us look at each of these in turn. Especially in Unit 1 and Unit 3, but also in some others, you will be asked to read passages in the Christian Bible. To make this easy, have a Bible to hand during your study if you can. This said, a number of very reliable English translations of the Bible are easily accessible on-line. The translation that Roman Catholics in Britain have become familiar with through its use in the liturgy is the New Jerusalem Bible (NJB). This is at http://www.catholic.org/bible. For this module, two others will be recommended when readings are set. A main reason for this is simply that these have rather more user-friendly websites than the NJB. The NJB and these two are generally regarded as highly reliable translations from the original Hebrew and Greek. The New Revised Standard Version (NRSV). This is widely used in academic study of Christianity. See: http://bible.oremus.org/. The search menu on this site is easier to use than on that for the NJB and biblical text is in a larger font. The New American Bible (NAB), which is accessible at the website of the US Catholic Bishops’ Conference: http://www.usccb.org/bible/books-of-the-bible/index.cfm. Teaching documents issued by the Catholic Church are the main ‘primary texts’ you will encounter in study of this module. You and I can’t really claim to know or understand CST well if we have read only ‘secondary literature’ about it, that is, discussions by commentators about the official Church statements. Therefore study of this module will enable you to engage with primary texts directly. Such documents include those issued in Rome by successive popes and other Vatican bodies, and also statements by conferences of bishops in each country (such as the Catholic Bishops’ Conference of England and Wales). The main primary texts in CST issued in Rome will be introduced on screen 1.2.3. All are easily accessible on-line and URLs will be given whenever you are asked to read from one. The secondary literature on CST consists of books and articles by scholars and other writers that discuss both the primary texts and the issues raised by them, practical and theoretical. For this module, most secondary texts are accessible on-line and URLs for them will be given on screen at the points where you are asked to read them. 1. 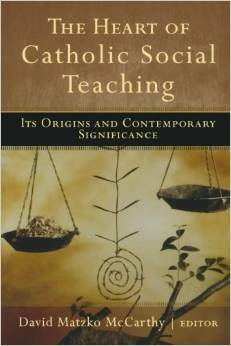 One book: David Matzko McCarthy, ed., The Heart of Catholic Social Teaching: Its Origin and Contemporary Significance (Grand Rapids: Brazos Press, 2009). Readings from this will be set in units 1, 3, 5, 6, 7 and 8, but not in units 2 or 4. It can be purchased for c.£12 (in 2014) through amazon.co.uk here. Students at the universities/colleges should be able to borrow this from the institution’s library. This is a small set of articles/chapters selected specifically for this module. If you are studying formally at one of the colleges/universities, the electronic module reader will be made available through your institution’s website. For legal reasons we cannot publish the material in the module reader on the VPlater website. However only a small proportion of reading for the module is in it, about 4% – so if you are not studying formally you won’t miss a great deal. Of course you might wish to get hold of hard copies of what’s in it from a library or other source. A list of both the chapters in the McCarthy book and items in the reader that are set as readings during the module can be seen here. Overall about 80% of the readings set are accessible on-line. Throughout the module, the readings you are asked to do have been carefully chosen to fit with the explanations and discussions on screen. So, to get the most out of it, you need to do them. That means that no searching for books or additional material is necessary. Everything has been done to make things as straightforward as possible – it is CST by sat nav. However don’t think it will be intellectually or academically easy. The primary texts mean that study of this subject is bound to be demanding, and the material you will encounter is at an academic level appropriate for undergraduate study. You may well want to pursue particular topics further than the designated ‘Readings’ allow, and this may be necessary for the particular assignments you do. In addition to those, you will find ‘Optional readings’ throughout the module. These too have been carefully selected and they give one way of beginning to take things further. Another important practical aspect of what study will involve is the discussion forums you will be expected to participate in when you reach the end of each unit (and possibly at other times). Details of these are given after the next two screens, in 1.1.5, ‘How to make the most of this study’. What topics does the module cover? We begin to look at this on the next screen. 1.1.4 How much time will it take?